As is customary these days, my DVR has prepared a new movie selection for me to watch. I have to admit that I would have never thought about watching these movies, but I find that most of my amazing movie watching experience comes from flying by the seat of my pants. It all started when I was a teen and my best friend and I decided to pick a random movie at the movie story (Yes, we had those when I was a kid). We picked Murial's Wedding that was supposed to be a comedy, but we actually found it extremely depressing (Just ask her). That experience gave me my start in forming opinions on random movies. You should really try it some time. 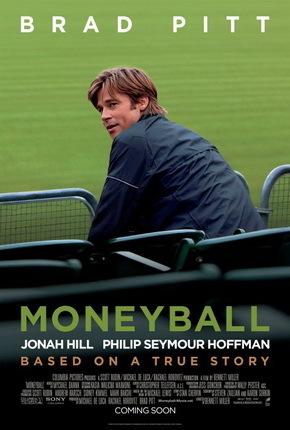 This weeks first movie is (2011) Moneyball with Brad Pitt, Jonah Hill and Philip Seymour Hoffman. I'm not a huge fan of sports movies but this one was a good story. "Oakland A's general manager Billy Beane's successful attempt to assemble a baseball team on a lean budget by employing computer-generated analysis to acquire new players." IMDB. It's based on a true story about what Billy Beane did for the A's in 2002. At the end of the movie you find yourself routing for the underdog as Billy does what no one has ever attempted to do. It of course has one of my favorite Chris' in it, Pratt (#2 Chris), but its such a small roll, its really not about him. This would be a great date night movie or lazy Sunday afternoon movie. My second pick for this week is (2006) Just My Luck staring Lindsay Lohan and Chris Pin (#4 Chris). I had high hopes for this film since it was directed by Donald Petrie who also directed How to Lose a Guy in 10 Days, but I felt like I was dropped on my head half way through. To tell you the truth, I didn't even finish the movie. 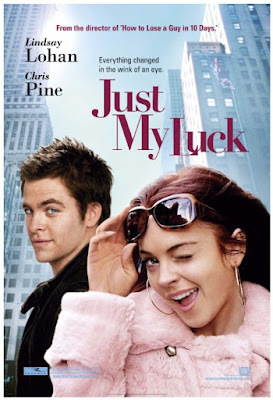 The premise is, there is a girl (Lindsay Lohan) who has great luck and a guy (Chris Pine) who has terrible luck. They meet at a party and trade luck. All hell brakes lose and that's when I couldn't bare to watch any more. It's not that I have anything against Lindsay, because I loved Mean Girls and the Parent Trap, but I was just left with a brain leak after watching this, I couldn't do it. The acting was way overdone, and the story was weak. It reminded me of a really badly written young adult novel, you know the ones that make you squirm when the characters talk, but not in a good way. Its just awkward. I don't recommend this movie unless you have a strange need to watch a terrible Lindsay Lohan film. As always, I love sharing the fun things that I find with you. If you have a movie you think I should watch, or have written a review and you would like me to feature you on my log, send me an email.